Winter weather seems magical and welcome during the holiday season. However, once Christmas and New Year’s come to an end, the snow and cold tend to lose their allure. The world is no longer a magical, winter wonderland. Instead it’s a desolate and bitter landscape that drops your motivation levels to zero. Most of us would like to ignore our jobs and duties and simply crawl into a cozy ball by the fire to read or binge-watch our favorite show. Moreover, for most adults there’s no holiday or break from the mundane in sight, now that the holidays are over. Unfortunately, warm weather and long, summer days are still months away, which means you have to find ways to pull yourself out of your winter coma all on your own. 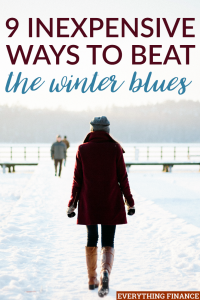 Try these 9 inexpensive ways to beat the winter blues and to start feeling energetic again. I’m sure the last thing you want to do on a cold, dark morning, or evening, is drag yourself to the gym. However, exercise isn’t just beneficial to you physically, but can have a large impact on you mentally as well. Physical activity can give you an emotional boost when those winter blues set in. Any activity is good, so if you can’t make it to the gym or are tight on cash, there’s an array of great free workouts you can do in the comfort of your own home. One of the gloomiest aspects of winter is the desolate surroundings. Everything green has turned to brown and all the flowers and bushes have most likely died, unless you live somewhere tropical of course. With spring still a little ways away, now is the perfect time to bring spring to you. Try growing your own herb garden with herbs like fresh mint and basil. Nothing says spring cooking like fresh herbs! Furthermore, consider purchasing plants to help brighten up your home. Try a mixture of greenery and flowering plants to feel the spring atmosphere early. Nothing can affect your mood quite like music that’s why I’m thinking on getting a piano from this review of the top digital pianos of 2017. Have you ever noticed the effect a certain song can have on you or the memory it can bring you back to? I don’t know about you, but I tend to have certain playlists designated for winter and usually, they’re a little cozier and a little less upbeat than what I’d play on a summer day. Regardless of the weather outdoors, turn on those upbeat, summery tunes and you’re bound to find your mood and energy level instantly lifted. It’s always exciting to find and start a new hobby. Having something apart from work to be passionate about and to nurture your creative side can be uplifting and fun. If you’ve ever wanted to learn to knit, take a pottery class, or learn to salsa, winter is the perfect time to do it. Since you’ll be indoors anyway and don’t have to feel guilty doing so on a nice day, it’s the perfect time to learn something new. Not only will it keep you busy, but it’ll give you something new and exciting to focus on. Again, the winter blues can make you become a bit of a hermit if you’re not careful. When it gets dark at 5 o’clock and its ten degrees outside, getting out to meet and hang out with friends can be a struggle. Still, spending time with friends and loved ones is often times an instant mood-booster. As humans, we crave to be around other humans. Even if you don’t go out on the town, take time to have movie nights, dinner parties or even start a book club to help beat your winter mood. Now is the time to take on some of those indoor projects you’ve been dying to complete. Use being stuck inside as an opportunity to freshen up the paint on your walls, take down old wallpaper, or reorganize your kitchen. House projects that keep your hands busy and make small changes to your environment can make all the difference, and won’t cost you a fortune. Volunteering is not only free, but tends to be all-around good for the soul. Giving your time to help others is rewarding both mentally and emotionally. Whether you volunteer to help a neighbor, babysit, help out at an animal shelter, or give your time to the local food bank, focusing your mind on others is always a beneficial task. When you see how your deeds benefit and lift someone else up, it’s impossible to feel gloomy. The cold weather can be hard to take, but I think you’d find that if you simply embrace it, it can’t get you down. If there’s snow on the ground, channel your inner child and build a snowman or go sledding. Once you’re done, head back inside and enjoy warmth and hot chocolate. Nothing is cozier or more nostalgic than warming up with a nice cup of hot cocoa. When you’re a kid, the snow is always a welcome visitor. We just sometimes forget that as adults. Baking is one of those activities that just warms you from the inside out. When you’re stuck inside, it can be a great way to keep busy and enjoy a nice treat. Furthermore, it’s always fun to wrap up your concoctions and pass them out to family, friends and co-workers, as it often elevates their moods as well. And no one said you had to make it from scratch if that’s not your thing, since a tube of cookie dough has the same effect. Spring will grace us with her presence again soon, but until then, winter is here to stay. So, instead of letting the cold and dreary weather keep you hibernating indoors, find simple and easy ways to make the most of it. You just might find that winter’s not as bad as it seems. How do you keep yourself busy during the winter? What are some of your favorite indoor activities to beat the winter blues?